Below are photos of a project conducted at our groves in 2004. 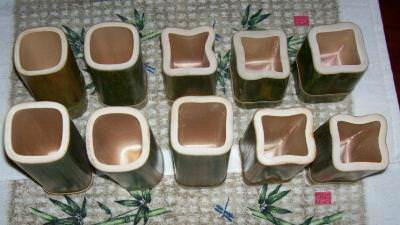 When I first saw a 6 inch long by 3 inch diameter piece of square bamboo, I was truly amazed. 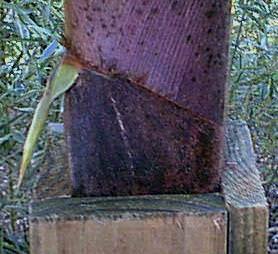 Knowing bamboo species fairly well at that time, I knew no species grew to that diameter in a square form. 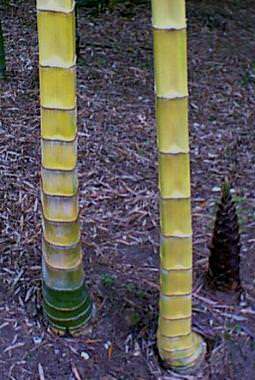 One species known as ‘Square Bamboo’ is Chimonobambusa quadrangularis. 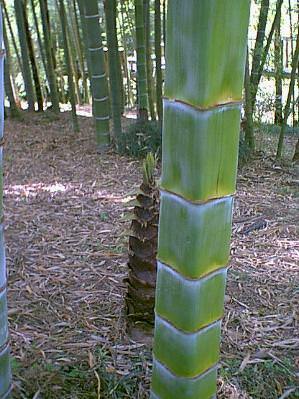 Under good conditions, this bamboo will mature at 1.5 inches in diameter. I knew this wasn’t a normal cut section of pole I was looking at, it was something unique. I saw the piece of bamboo sell for $125.00. My curiosity was spiked. After years of growing and working with bamboo crafts, I decided to attempt the project. I have built all types of art work from bamboo over the years. I have worked with heat to bend and shape dried bamboo into various artistic designs and have carved, cut and painted many projects. But this was a totally new venture because it was to be made from a live bamboo plant emerging from the ground. Predicting the diameter one of these giant ‘Moso’ when it first emerges is difficult and I will reveal one of the main keys to forming this type of art work. I refer to it as living art and thoroughly enjoyed this project. 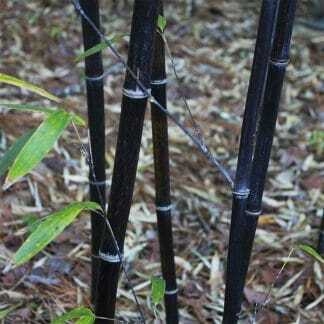 It is easy after growing bamboo to look at a 6 inch tall shoot and say it will be three inches in diameter at maturity. What is difficult is coordinating the enclosure size with the estimated culm size. With no one to guide me or books to read, it was fun and challenging to say the least. 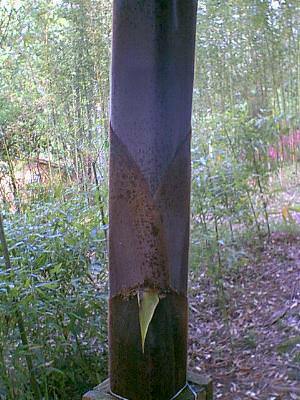 A bamboo shoot that is 4 inches in diameter is a mighty force to harness and will move most objects that are in it’s path. Take a look at the pictures I have taken of the neat process. I hope you enjoy, but please understand if I do not reveal my little technical secrets. Close up photo from a different angle showing the corner with tip of culm sheath revealed. Note the tiny hair covering the culm ( cane ) sheaths. Even the new culms underneath these coverings have tiny hairs. 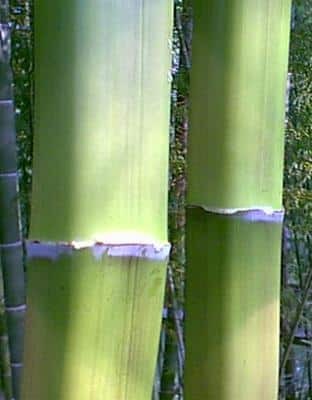 The full name for ‘Moso’ is Phyllostachys heterocycla pubescens. The word pubescence means covered with fine short hairs. These tiny soft hairs weather away from the canes usually by the second year. Close up of two squared canes in our groves. Culms held the squared shape 12 feet up on some of the specimens. The height placement of the enclosure will determine many factors. Enclosures have been removed revealing the squared culms. Timing here is important for sheaths to fall away. If they are kept too long the culms will be damaged. If they are removed too soon the culm growth is retarded and their normal height will not be attended. A closer view showing the same two culms. Since they have never seen the light of day they are pale yellow in coloration. This will change soon they will turn their normal beautiful green. This view is also showing a three inch diameter culm in the background that aborted. This is a normal variant with ‘Moso’. 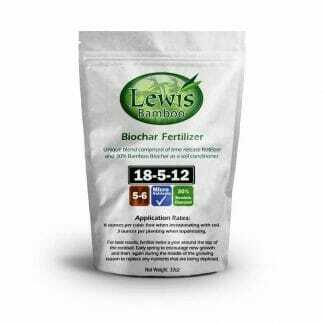 Some years over 40% of shoots abort with the rest completing their growth period over a 60 day span. Emerging from the ground in our climate zone during the middle of March. By the end of May all have grown to their full height and limbed out with leaves. A three inch diameter culm of ‘Moso’ will be over 50 feet in height and will have done this in two months time. Another close up shows the indented area where the sulcus groove will form further up the culm. 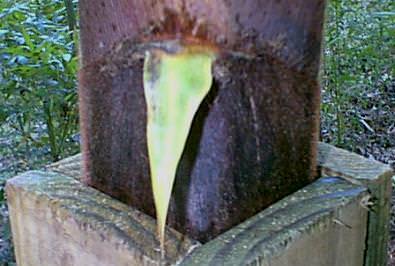 A ‘Moso’ pole will need to harden off for three complete years on average before cutting. If it is cut too early that is a likelihood of the wall splitting. Season cracks are fine, but you would not want a complete crack to occur after all this work.